HomeFinancialDid the Economy Just Stumble Off a Cliff? The signs are everywhere for those willing to look: something has changed beneath the surface of complacent faith in permanent growth. This is more intuitive than quantitative, but my gut feeling is that the economy just stumbled off a cliff. Neither the cliff edge nor the fatal misstep are visible yet; both remain in the shadows of the intangible foundation of the economy: trust, animal spirits, faith in authorities’ management, etc. Since credit expansion is the lifeblood of the global economy, let’s look at credit expansion. Courtesy of Market Daily Briefing, here is a chart of total credit in the U.S. and a chart of the percentage increase of credit. 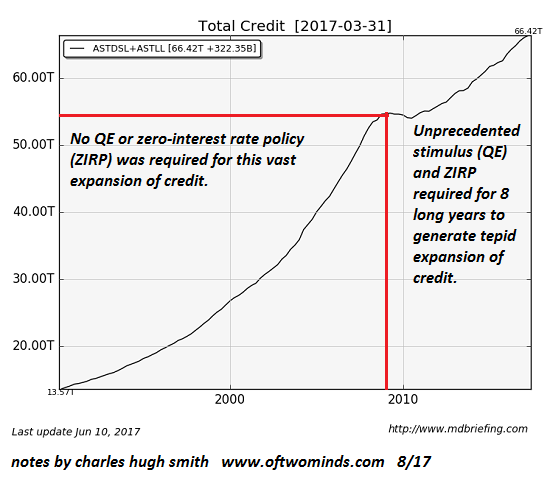 Notice the difference between credit expansion in 1990 – 2008 and the expansion of 2009 – 2017. Credit expanded by a monumental $40+ trillion in 1990 – 2008 without any monetary easing (QE) or zero-interest rate policy (ZIRP). The expansion of 2009 – 2017 required 8 long years of massive monetary/fiscal stimulus and ZIRP. This chart of credit change (%) reveal just how lackluster the current expansion of credit has been, despite unprecedented trillions of stimulus pumped into the financial sector. 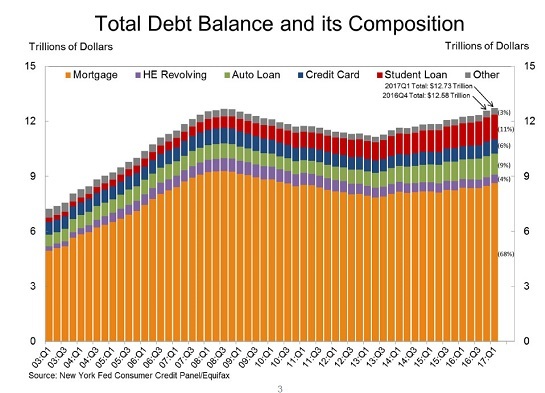 Here are two other snapshots of debt: margin debt and private credit. Both have hit new highs. 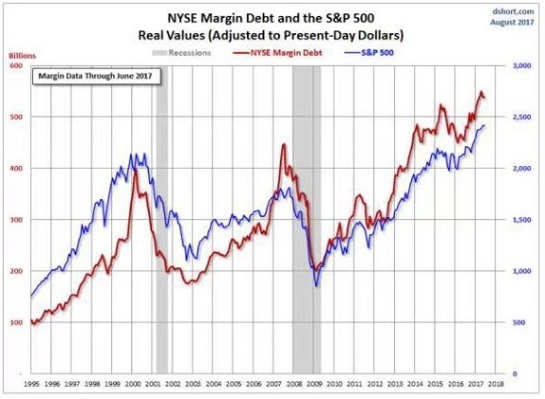 Note the tight correlation of margin debt to the S&P 500 stock index: when punters borrow more on margin to buy more stock, stocks keep rising. 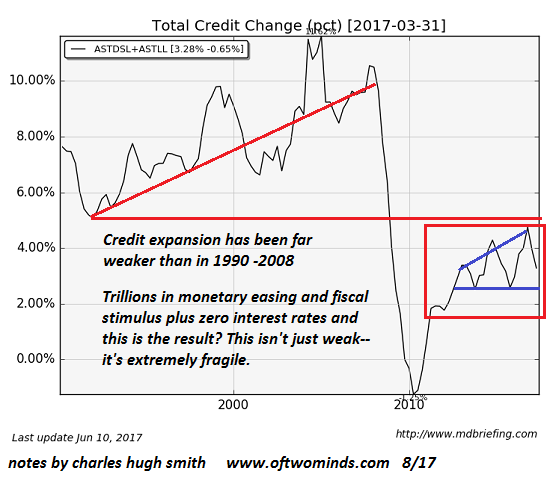 When credit stops expanding, the economy stumbles into recession. Back in the real world, have you noticed a slowing of animal spirits borrowing and spending? Have you tightened up your household budget recently, or witnessed cutbacks in the spending habits of friends and family? Have you noticed retail parking lots aren’t very full nowadays, and once-full cafes now have empty tables? According to the conventional economic statistics, everything’s going great:there are millions of job openings, unemployment is near historic lows, GDP is expanding nicely and of course, everyone’s favorite signifier of wonderfulness, the stock market, is hovering near all-time highs. The possibility that the real economy just stumbled off a cliff creates instantcognitive dissonance, as the official narrative is the economy is expanding slowly but surely and everything is nominal: there’s plenty of everything, from oil/gas to consumer credit to jobs to student loans. Nonetheless, I feel a disturbance in the Force: once credit expansion slows or ceases, the economy will roll over into recession, as wages have been stagnant for the past 17 years, and the bottom 95% of households can only spend more if they borrow more. Though it’s bad form to mention it, everyone’s favorite signifier of wonderfulness, the stock market, is by most measures overvalued and priced to perfection. Meanwhile, after failing to normalize interest rates and its balance sheet years ago when the economy had already recovered some stability, the Federal Reserve (and a few other central banks) are hurrying to make a grand show of ticking rates a bit higher before the next recession reveals the systemic failure of their 8-year long campaign of permanent monetary stimulus and near-zero rates. Everything that could rescue the stock market from swooning has already been done: buy hundreds of billions of dollars of stocks via index funds? Done. Constantly communicate the god-like powers of central banks to fix anything and everything in global equity and bond markets? Done, to the point of boredom. How can anyone trust a market that has been massaged and manipulated for 8 long years? What sort of price discovery is possible if central banks have been major buyers for years? Beneath the surface of complacent tranquility and absolute faith in the god-like powers of central banks, a skittish awareness of risk and fragility is rising.I would contend that this is true not just in moneyed circles with access to the best private research, but in households that are sensitive to the first tremors of the coming earthquake, and alert to the note of alarm in the canary’s warblings down in the coal mines of the economy. I suspect all those who have placed their trust in everyone’s favorite signifier of wonderfulness, the stock market, have forgotten that signifiers can work both ways: nothing signals recession and a panicky urgency to sell everything that isn’t nailed down like a sharp swoon in stocks that fails to respond to a “buy the dip” buying frenzy. The faith in “buy the dips” (i.e. “the Fed has our backs”) is not based on an immutable law of Nature; stocks can (gasp!) actually succumb to gravity. And when they finally do feel the tug of gravity, the belief that “buy the dips” is a permanent strategy will be revealed for what it is: a long, heavily-juiced run that eventually ends. The signs are everywhere for those willing to look: beneath the surface of complacent faith in debt-fueled permanent growth, the economy is stumbling. Recessions are typically identified after months of squinting in the rearview mirror, but we don’t need an official declaration to sense that something has changed.